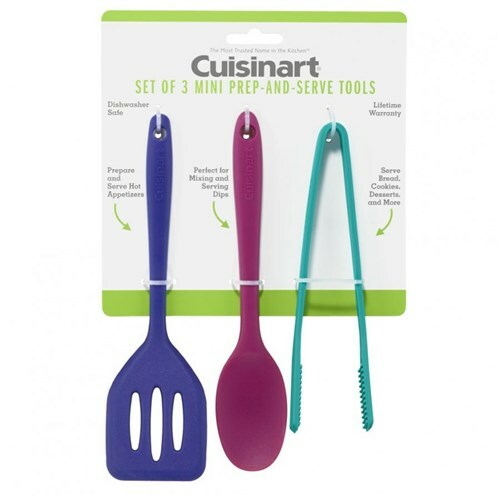 The Cuisinart CTG-00-3MPT has a set of 3 mini prep and serve tools including mini turner, spoon, and tongs. It is silicone with reinforced core for comfort, strength, and durability. Mini prep and serve tools is perfect for preparing and serving a wide range of dishes like hot appetizers, mixing and serving dips, serving bread, cookies, desserts, and more. The Cuisinart Set Of 3 Mini Prep-And-Serve Tools has many exciting features for users of all types. See the Cuisinart Set Of 3 Mini Prep-And-Serve Tools gallery images above for more product views. 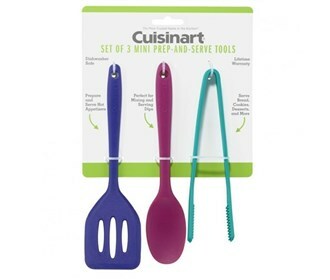 The Cuisinart Set Of 3 Mini Prep-And-Serve Tools is sold as a Brand New Unopened Item.